Podcast Episode Titles | How Should I Name My Episodes? Your podcast episode titles are vital to the success of your show as a whole. You can pour time and energy into creating the best content humanly possible. But if you don’t put a bit of thought into the naming of that content, you’re going to put serious limitations on its overall reach and impact. So how do you go about coming up with good titles for your episodes? What considerations are there? And are there any “rules” to be aware of? One way to prevent the name of your episode from becoming an afterthought is to have a clear plan and aim behind your content. For example, some of the most effective types of episode title are things like “how to…[do something]”, or “7 tips for… [achieving something]”. These kinds of episodes basically have their titles in place before they are recorded. It’s all part of the planning. So if you’re doing things like lists, comparisons, reviews, or case studies in your episodes, then the titles are basically going to pick themselves. 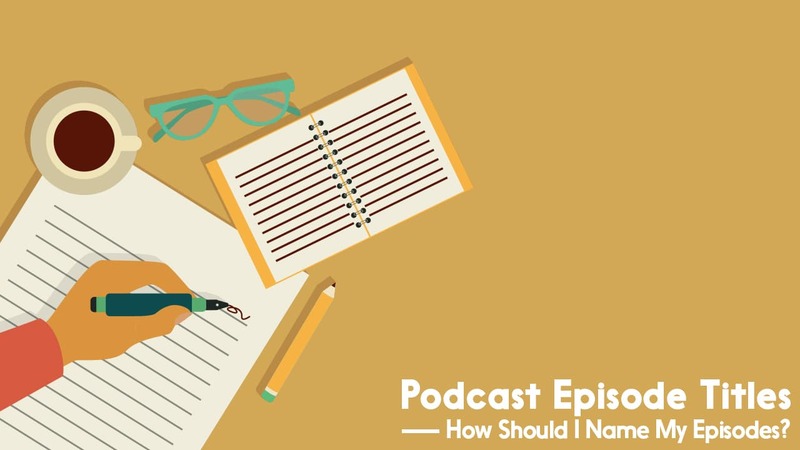 If it’s an interview or a monologue though, you might need to retrospectively decide what the most valuable part of the episode was, and create your title around that. So it isn’t simply about choosing a title for your episode. It’s about deciding what your episode will be about, and why. When planning your next batch of episodes, have a think about your target audience. The podcast listeners who haven’t discovered your show yet. What sort of terms are they searching for? What questions are they seeking answers to? How are you positioned to help them? Make it as clear as possible in your episode titles that this is exactly what they’re looking for. Remember, it’s not “clickbait” if you’re delivering on your promise in the episode itself. Podcast directories are essentially just search engines, so make sure your titles are the sort of things that’ll show up in a search on that topic. There’s no need to guess how effective your titles are in the long run. Looking over your stats will show you at a glance how many people are hitting play on or downloading each episode. You can compare episodes with others released in the same period and look for patterns. Check to see if certain types of titles performing better than others. For an even deeper dive, you can look at your iTunes Podcast Connect data to get a sample of listener completion rates for your episodes. If your titles are doing a great job enticing people to hit play, but nobody is listening for very long, then it’s possible you aren’t delivering on what listeners feel you’re promising them. This advice so far is definitely geared towards “industry” podcasts. But there’s a lot of other types of show out there too. If you run a fiction podcast, or a more experimental type of human interest series for example, then these literal titles won’t necessarily work for you. With this branch of podcasting though, the majority of listeners discover their favourite shows through means other than search. Word of mouth and having an active and engaging social media presence is going to be much more important than episode titles here. Of course, it’s still a good idea to get certain keywords related to your content in there over time. If your show had a Lovecraftian theme, then the odd nod to the Cthulhu Mythos in your titles won’t do you any harm at all. Overall though, you definitely have a lot more creative freedom here than someone who podcasts help and advice topics as an industry leader or content marketer. How Long Should My Podcast Episode Titles Be? Just like your episodes themselves, shoot for “as long as it needs to be, and no longer”. Consumption takes place on a vast number of different apps. These apps vary with how many characters in your title they’ll show, before cutting it short. If your title exceeds around 60 characters then you’ll start to find it cut short on certain apps, so that’s a good ballpark maximum length to shoot for. There are some things worth avoiding when it comes to actually typing out your title in your media host. First up, consider leaving the name of your podcast out of your episode titles. This can be redundant and waste valuable space. All listening apps will display the name of the show alongside the episode title when it’s found in search, so there’s no real need to add it in anywhere else. But if you’re creating your episodes in WordPress alongside other blog content you might still want the podcast name in there. If that’s the case, stick it at the end. Also avoid pre-loading your episode titles with numbers or codes. If you want to put these in, put them at the end too. Here are some examples (good and not so good) of how we could lay out the title of an episode of our own show, Podcraft. Let’s say the episode topic is our top 10 USB mics for podcasting. All good media hosts support iTunes/Apple Podcasts optimisation nowadays. 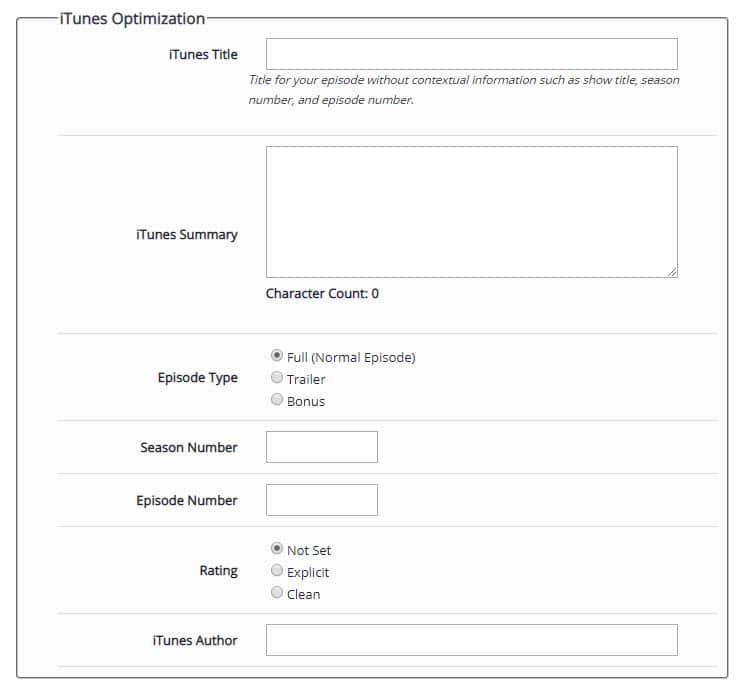 These fields – which you’ll find when creating your episode inside your chosen media host – let you assign an Apple-only title and episode number to your episode. This will appear in place of your “main” episode title. The theory behind this seems to be that Apple wants to “clean up” their directory, improve the user experience, as well as the overall consistency and accessibility. Here, you can see an example from inside Libsyn. Apple don’t want anything in your iTunes Title other than the title of your episode. So in our case, based on the examples above, we’d simply enter Top 10 USB Mics for Podcasting in there. We’d then put 25 in the Episode Number field. This means we could have the episode name display as one of the examples we’ve listed above in all other directories (Spotify, Stitcher, etc), whilst taking advantage of these features for appearing inside Apple Podcasts. So naming your episodes really shouldn’t be complicated. Create content your target audience will find valuable. Title it so it shows up clearly in search. Don’t waste space – be as succinct as possible. Avoid putting episode numbers, your podcast series name, or the word “Episode” in there. Unless it’s at the end. Monitor your stats over time to see how various titles are performing. And if you’re a non-industry podcast, you can be much more creative with your titles. If your show is good, people will discover it in other ways. If you’re looking for more direct support or guidance, remember to check out The Podcast Host Academy. In there, you’ll get access to our regular live Q&A sessions, as well as all of our courses, on everything from monetisation and promotion to voice training and audio editing! Podcast Episode Length: How Long Should My Episodes Be?